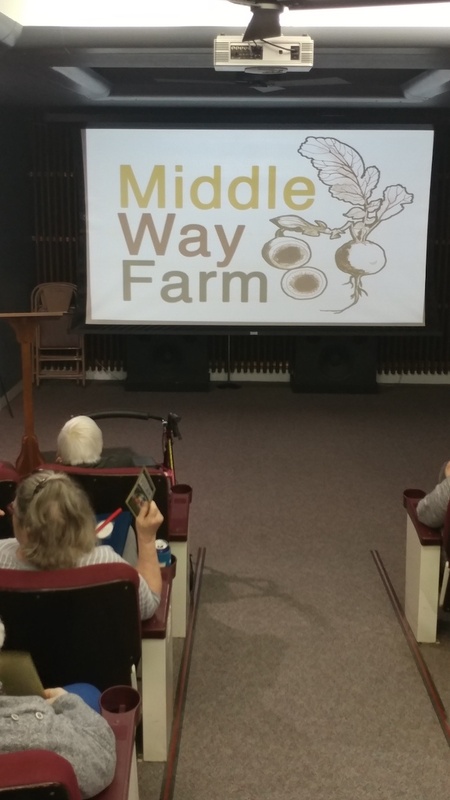 On Monday, March 18th, in the Mayflower Community Kiesel Theatre, Jordan Scheibel, owner of Grinnell’s Middle Way Farm, presented information about his Community Supported Agriculture (CSA) program. During the 2019 growing season—June through October—Jordan will deliver food boxes of fresh vegetables to a pick-up site every Wednesday at 4:00pm. Grinnell residents are welcome to participate in the program with vegetable receipt on the Buckley Courtyard veranda, accessible from Mayflower Lane. Middle Way Farm is a transitioning to organic market garden operated by Jordan with assistance from part-time employees and volunteers. Jordan leases the land from the Lacina family just north of the Grinnell city limits. The traditional offering is the “Farmer’s Choice Standard Share,” a diverse weekly box of vegetables chosen by the farmer based on what is in season. A full share is $495 for the 18 week season. A half share is $290. In addition, there is a “Customer’s Choice Custom Share,” an ala carte choice from each week’s available vegetables. For the latter, customers may choose any quantity that is available. Jordan also brings vegetables to Grinnell’s Thursday afternoon Farmers Market. For more information, call 641-821-0753 or the website: middlewayfarm.com.